Unable to open document library with Windows Explorer when accessing WorkPoint with FQDN – Welcome! How can we help? Unable to open document library with Windows Explorer, I am prompted for credentials, and when I provide my cred. and hits OK, nothing happens I am just prompted again. Same issue when I try to save a document from MS Word. The problem is described in this article from MS http://support.microsoft.com/kb/943280. This problem resides on environments using FQDN for the WorkPoint site eg. http://workpoint.vestconsult.dk. 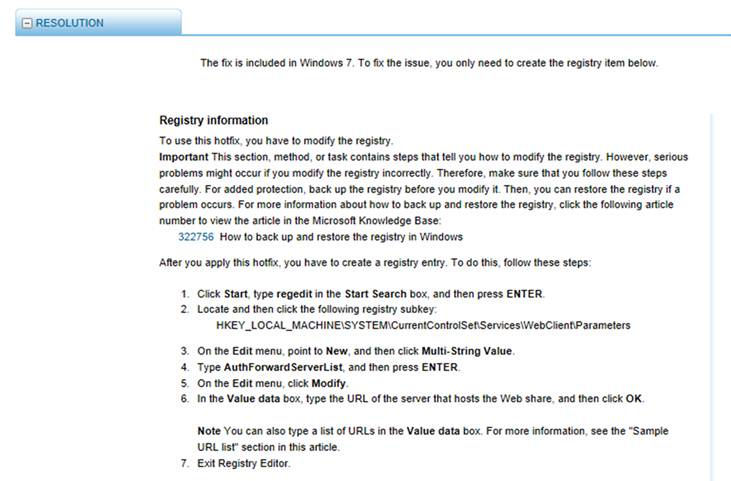 Insert the Registry value below and restart the WebClient Service.